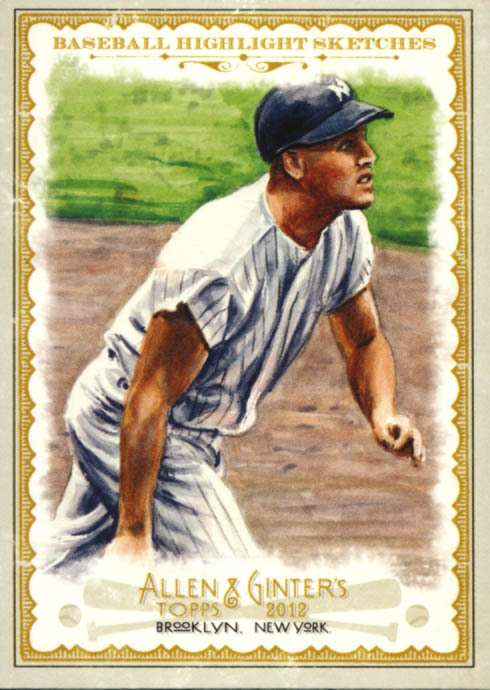 Collectors anticipate the return of Ginter. 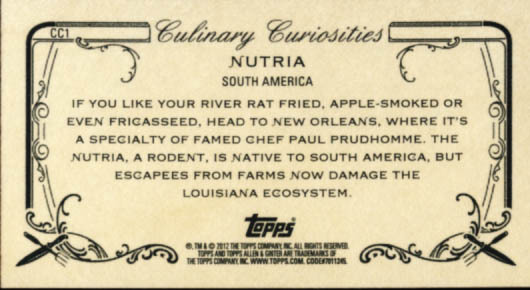 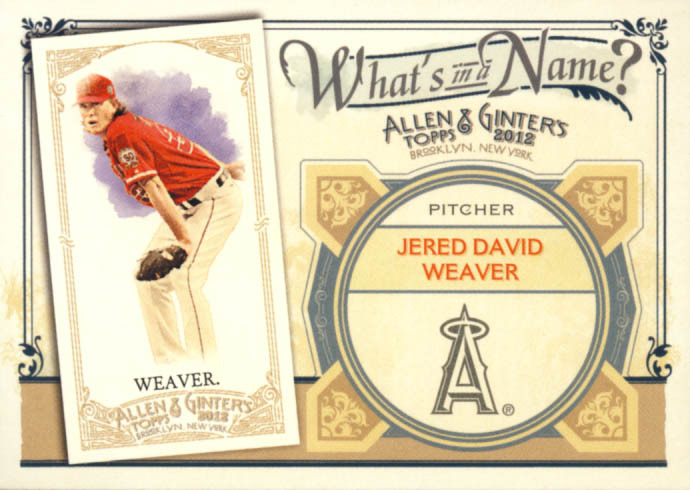 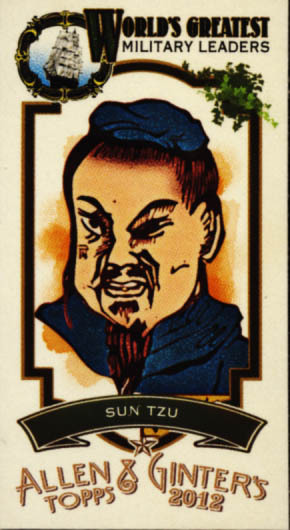 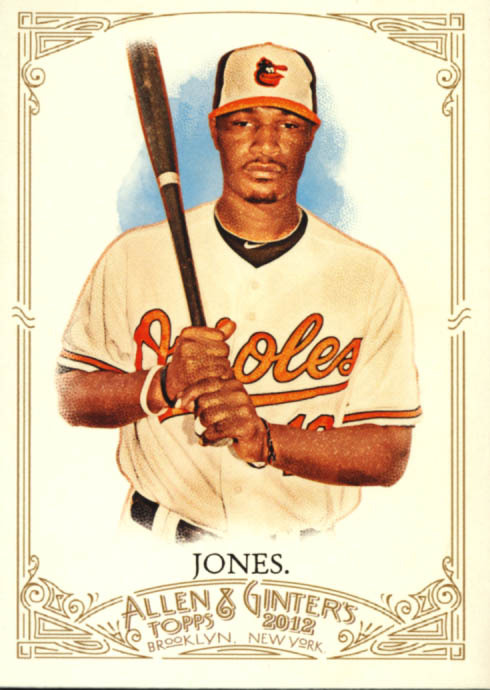 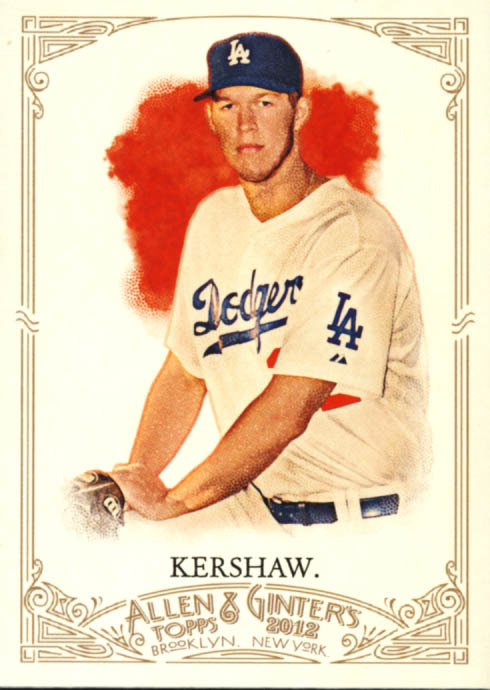 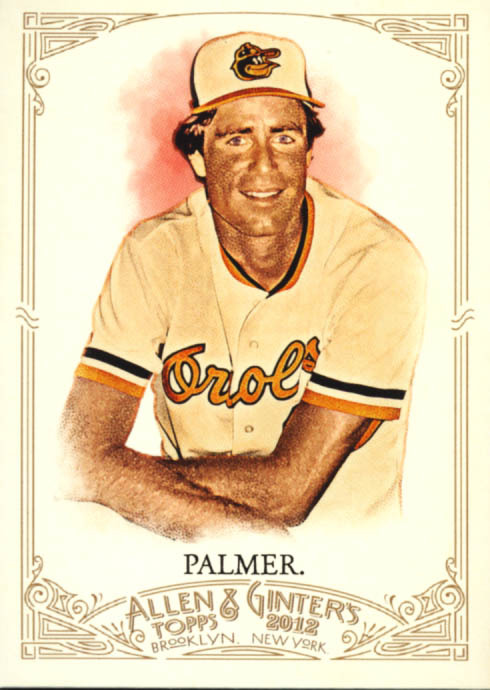 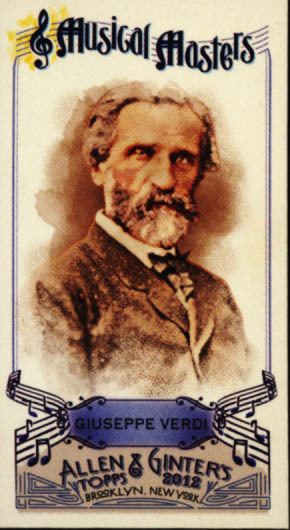 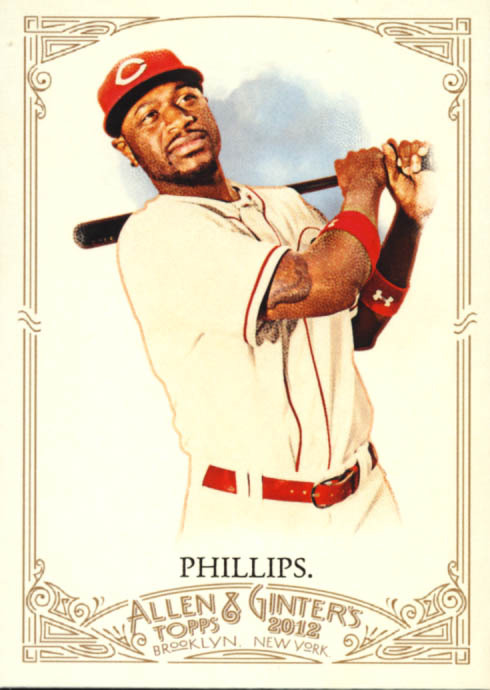 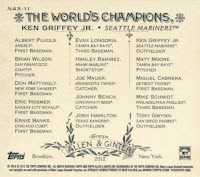 It is the most eclectic release of cards each year and 2012 Topps Allen & Ginter's Baseball Cards is no exception. 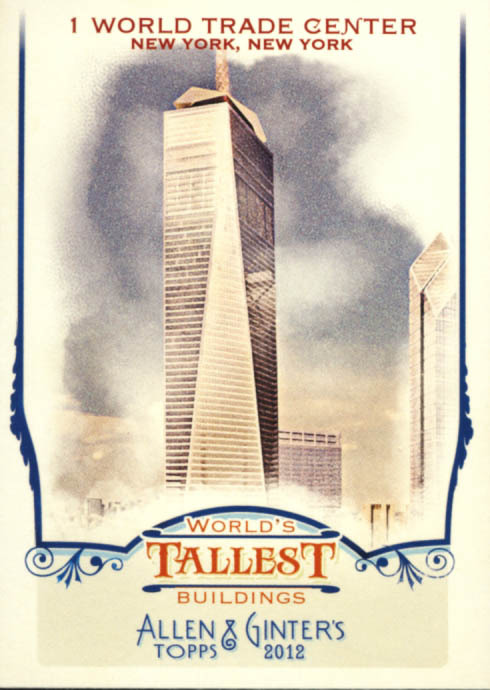 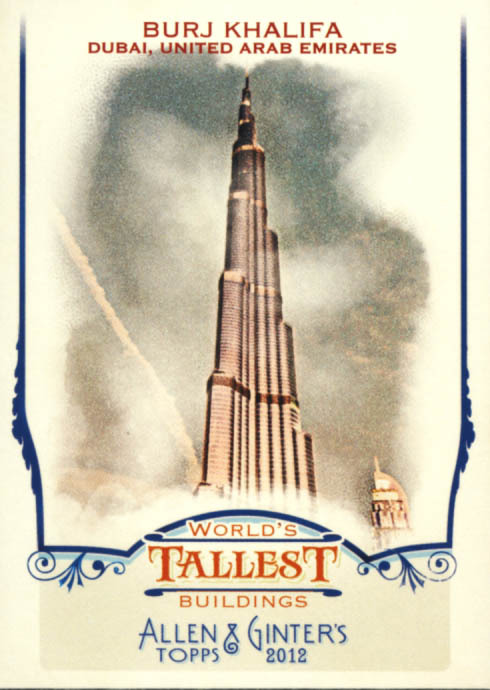 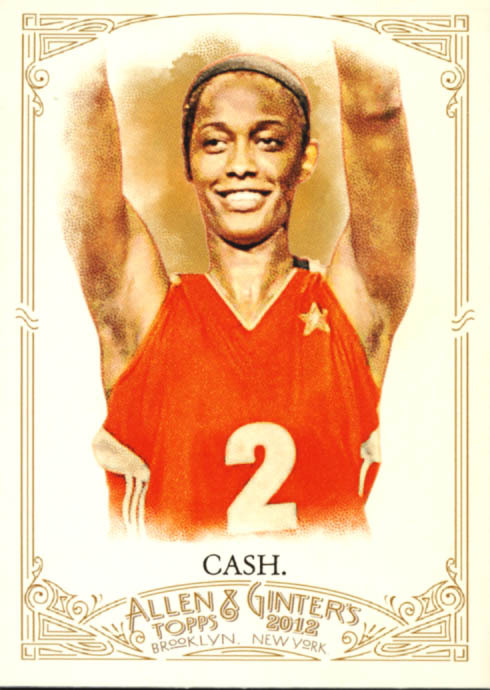 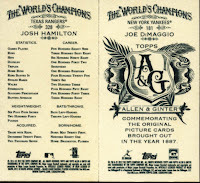 Combing greats of the game, both present and past, with celebrities, stars from other sports, heroes of the bible, cards devoted to the World's Tallest Buildings and foods that you might think twice about putting in your mouth, A&G offers a smorgasbord of cardboard delights. 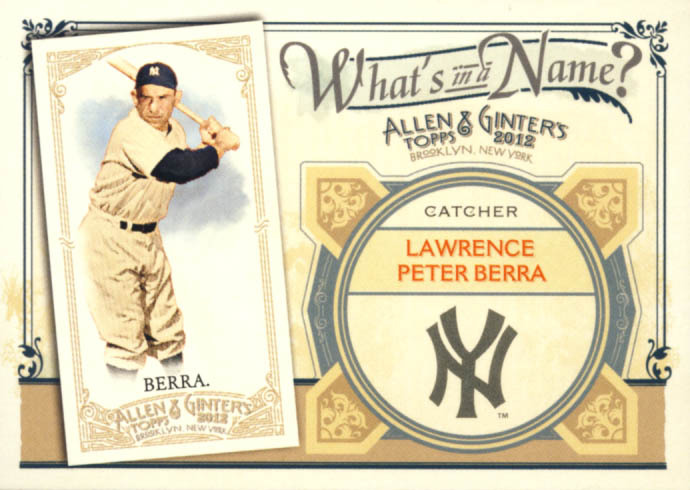 It remains one of the premiere releases for set builders. 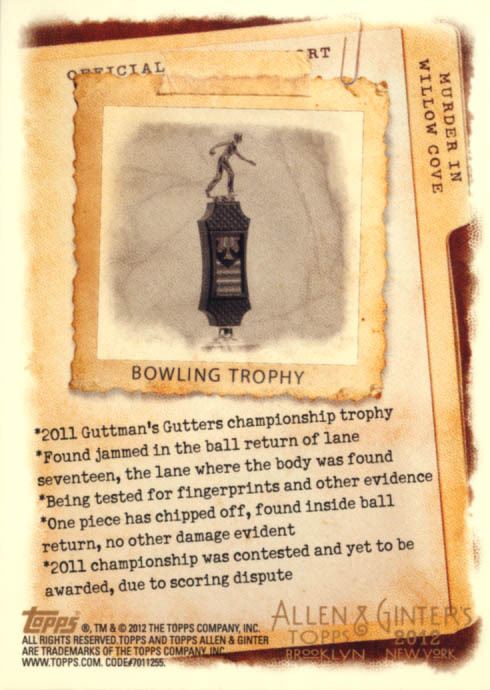 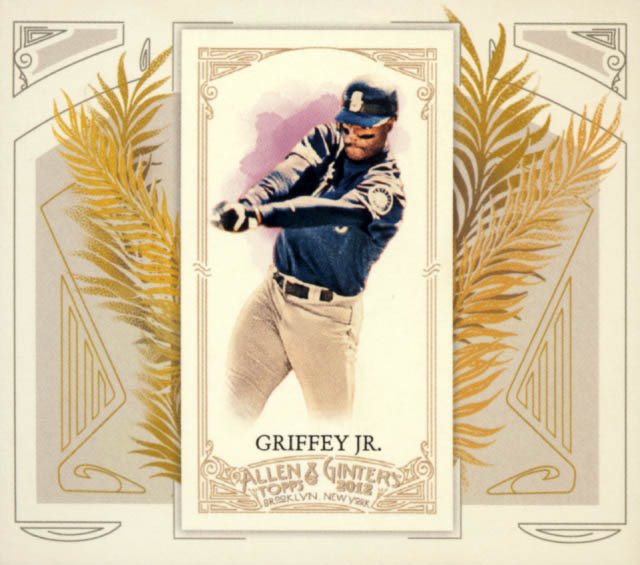 The Ginter Code returns but with a twist. 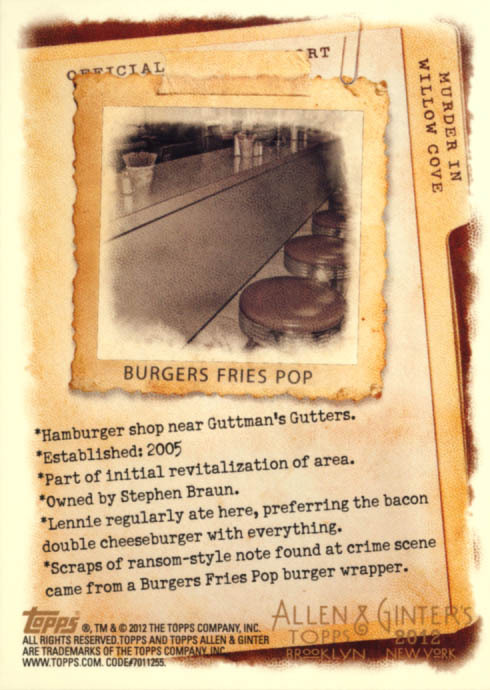 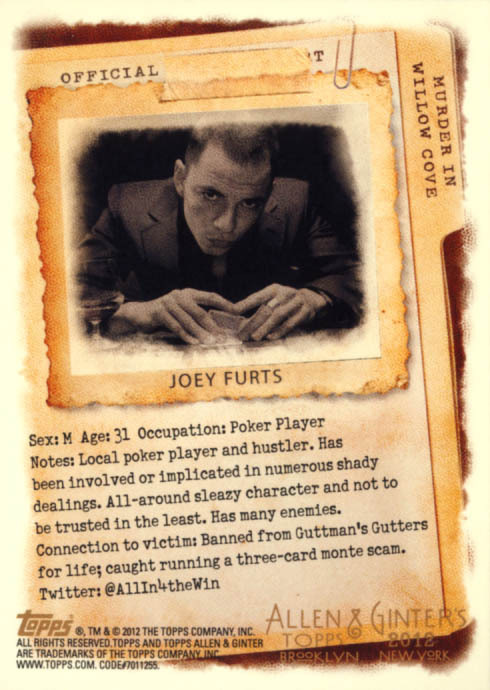 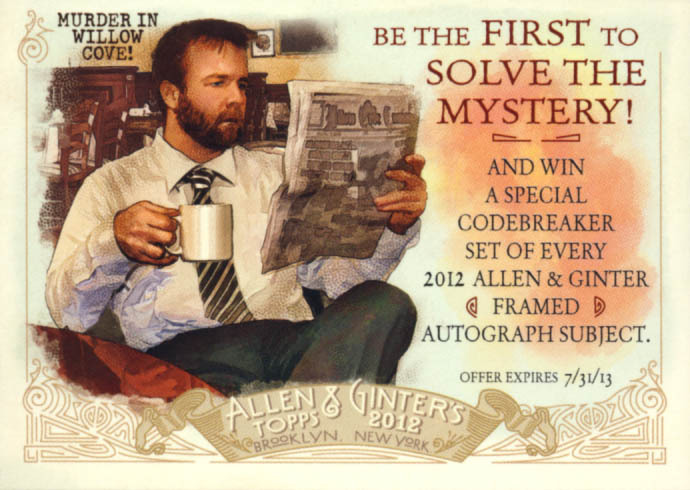 Instead of using a parallel code versions of the base set to crack the code, it has migrated to social media, with a murder mystery to solved with the clues coming from twitter accounts of the mystery's suspects, a blog run by the town's reporter and more. 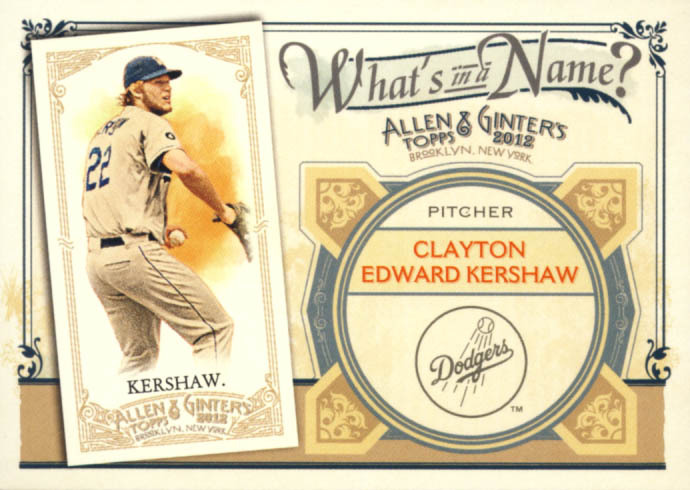 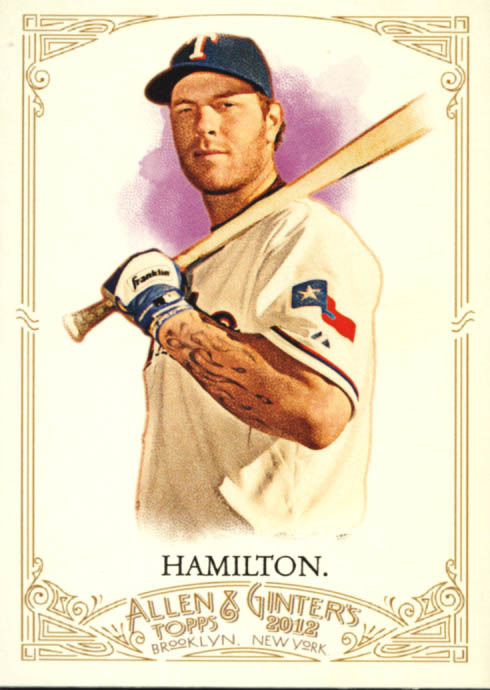 Currently the mystery has been solved but I am thrilled that Topps has chose this route, enjoyed seeing the story unfold and look forward to next year's code. 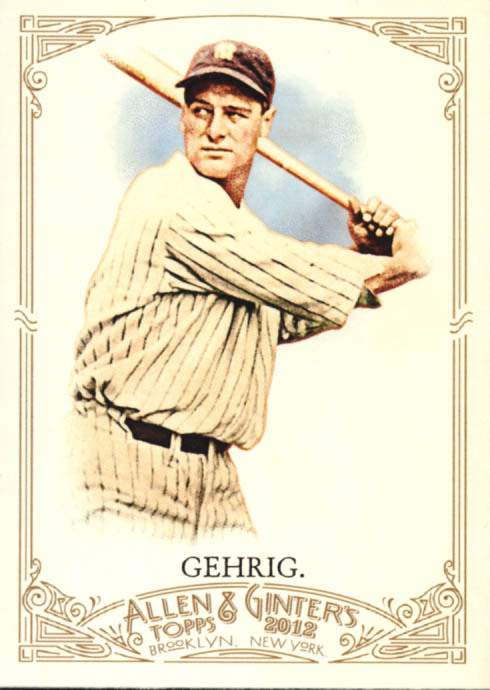 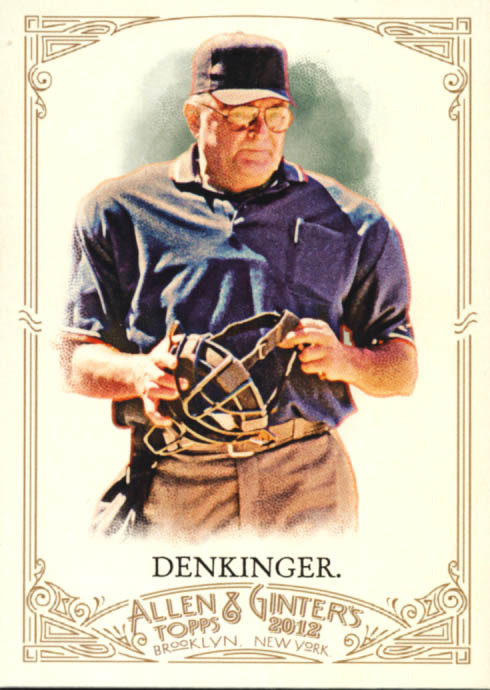 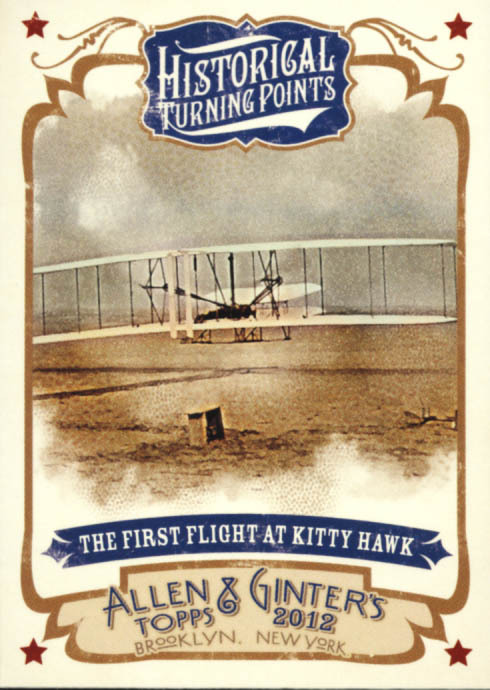 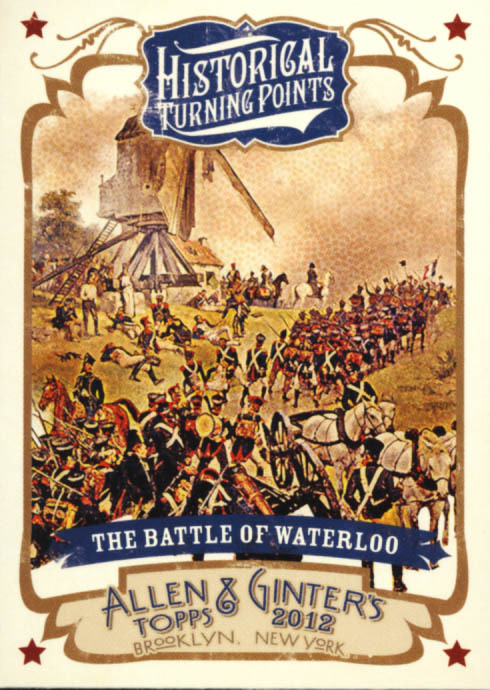 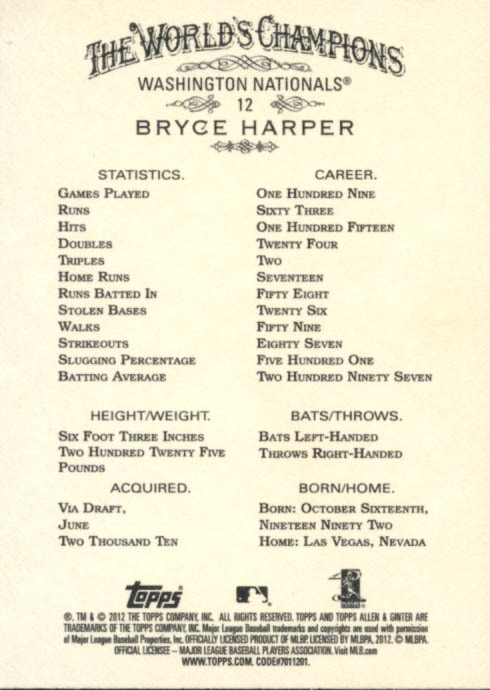 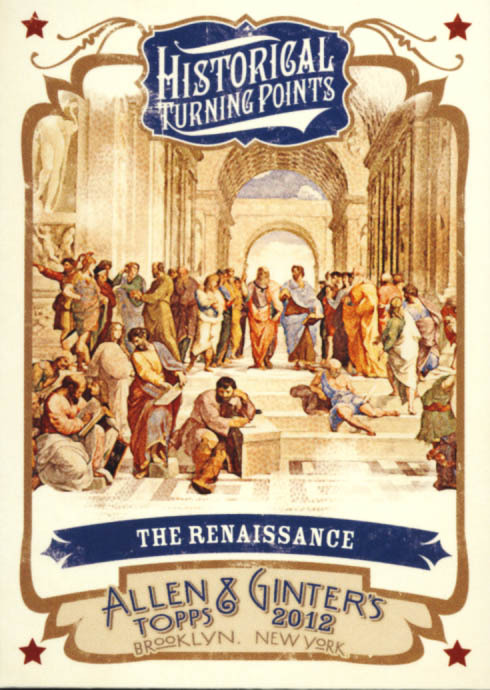 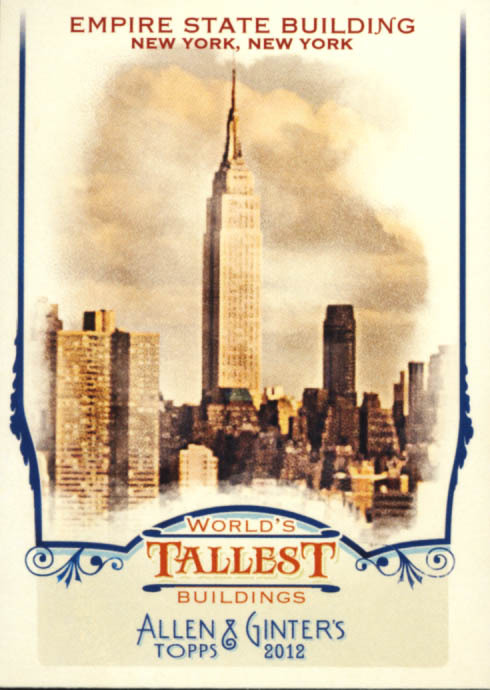 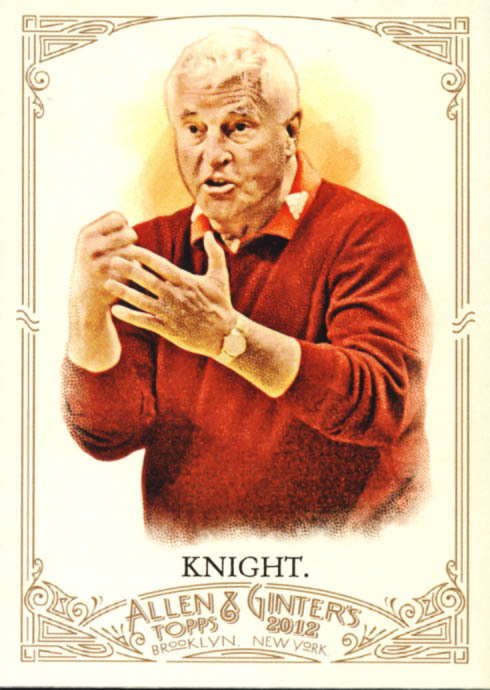 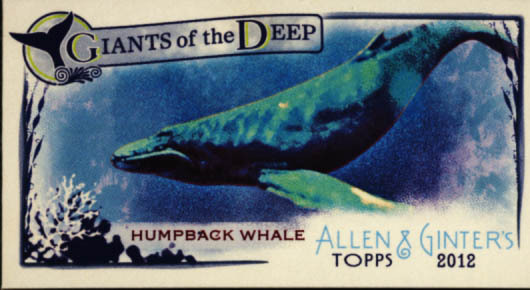 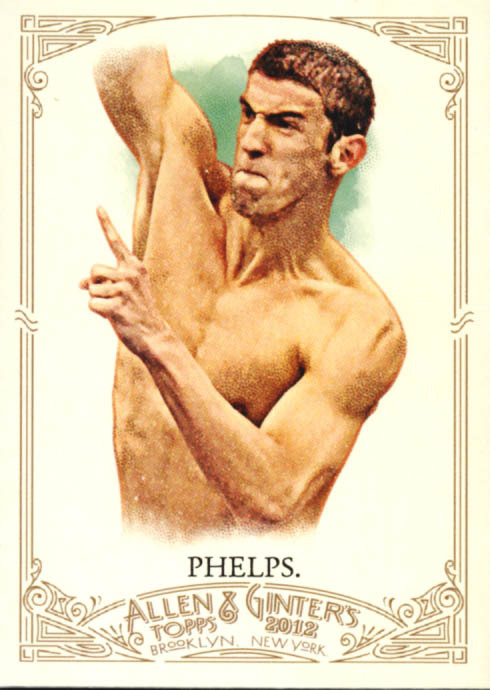 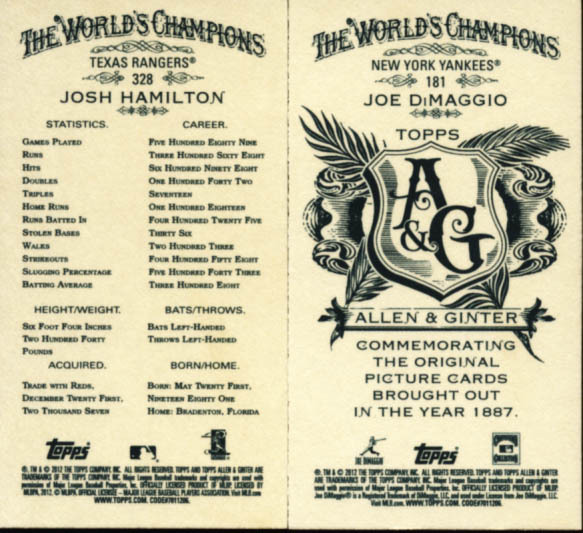 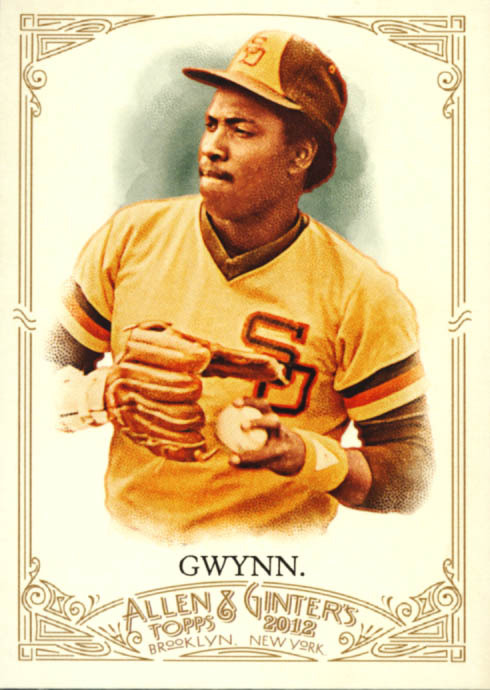 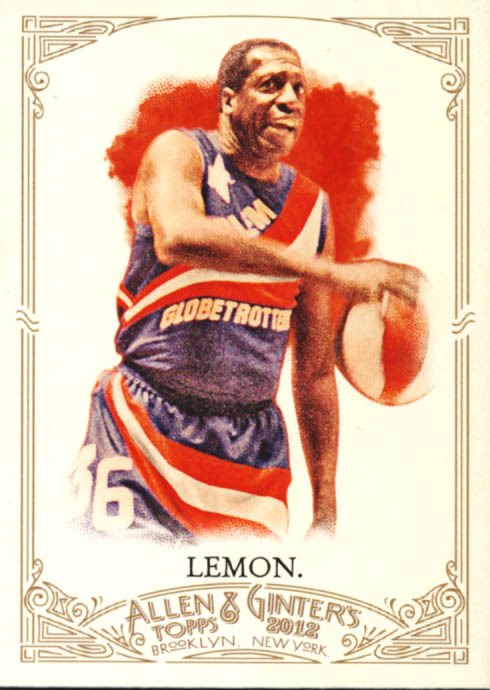 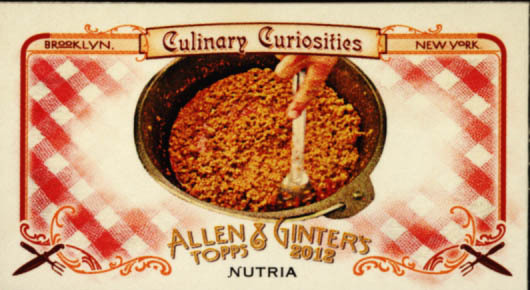 For the purposes of this review, Topps Allen & Ginter falls into our trading card category. 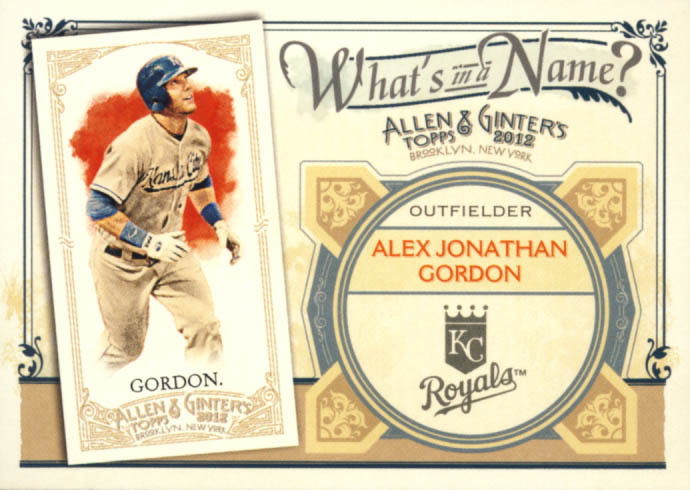 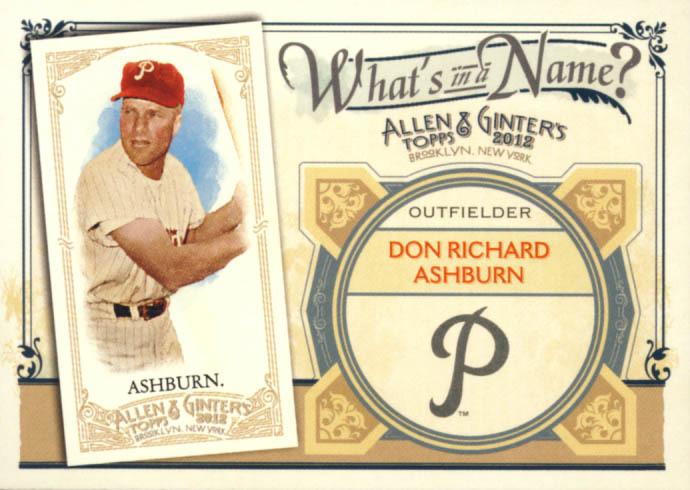 A&G comes in a wide variety of retail packages as well as one standard Hobby box format. For this review we will take a look at a hobby box which contains 24 - 8 card packs with the promise of 3 hits per box. 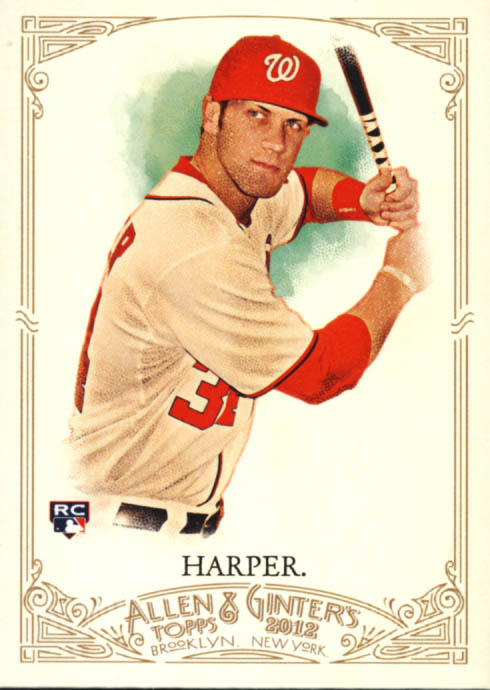 Topps has found a nice balance between the heavy bordering of the base cards from last year and the relatively sparse cards from years prior to that. 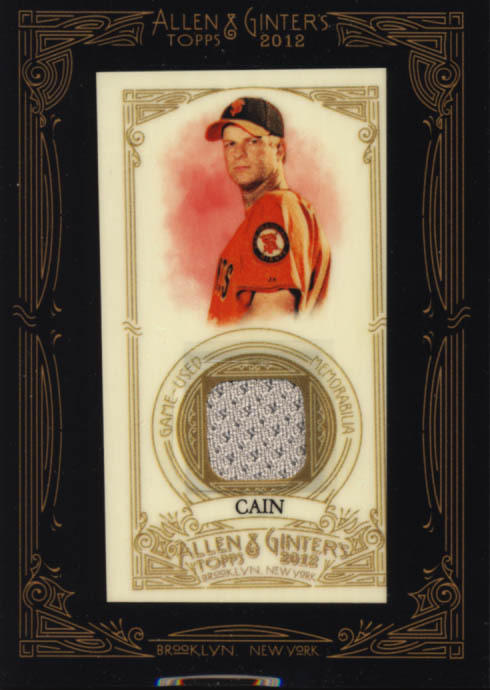 Black border framed relics look great. 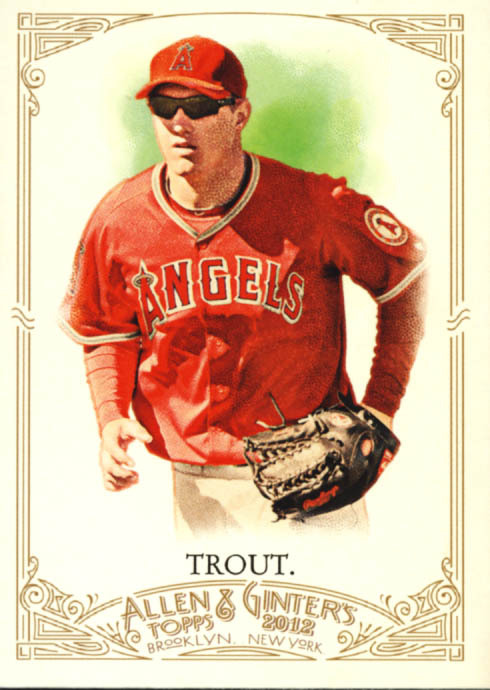 I'm glad that Topps migrated away from base code cards. 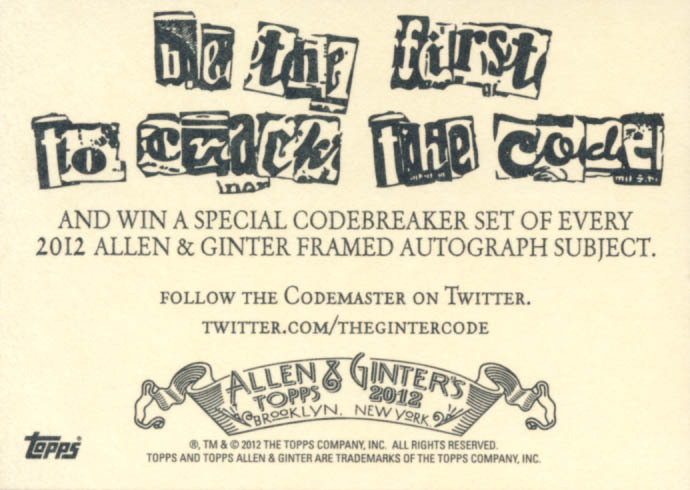 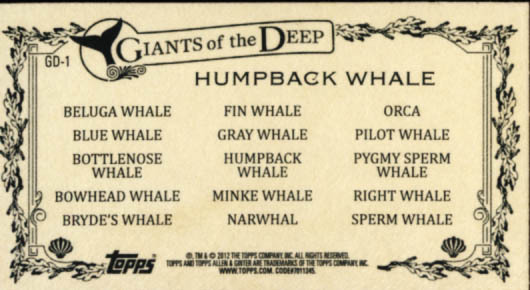 The cards were an important part of cracking the code, but left you with some unattractive cards afterwards. 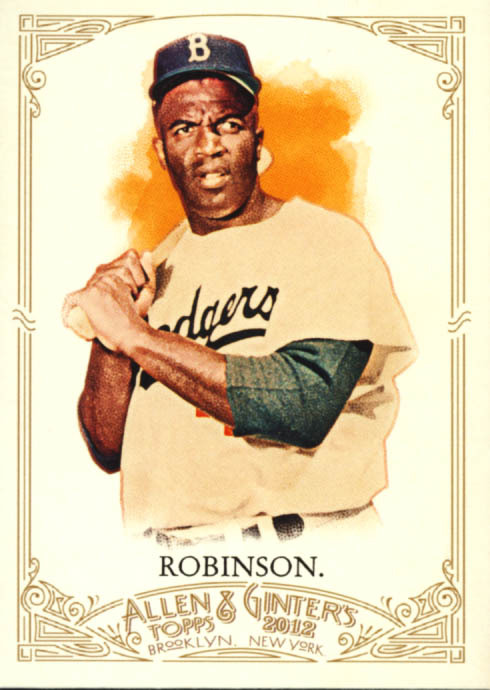 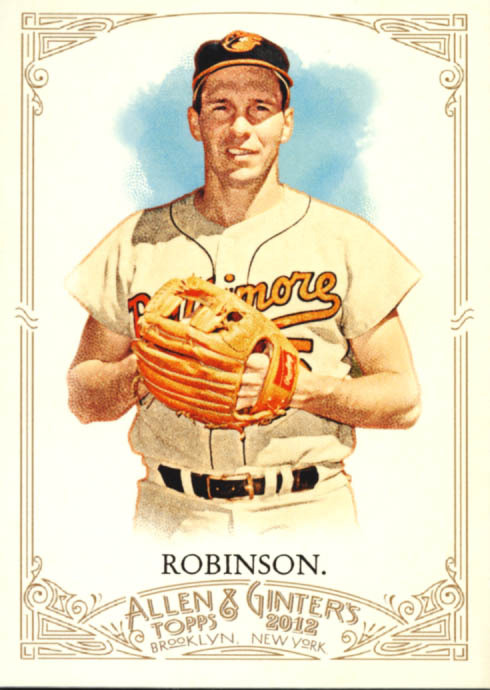 The Baseball part to the checklist works with strong veteran, rookie and legends. 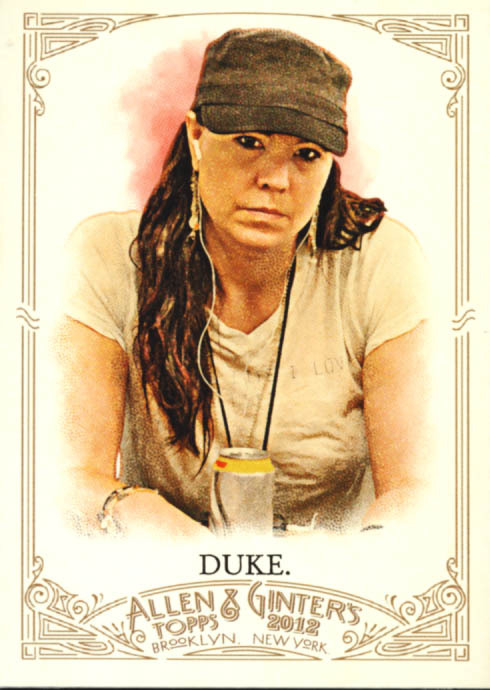 Clearly, collectors like good looking women in their card sets. 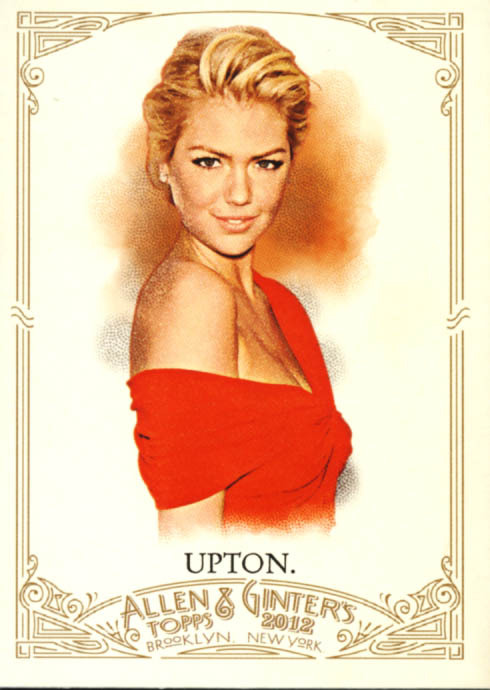 Kate Upton, this year's Sports Illustrated swimsuit cover model, has collector paying a huge premium for her cards on the secondary market. 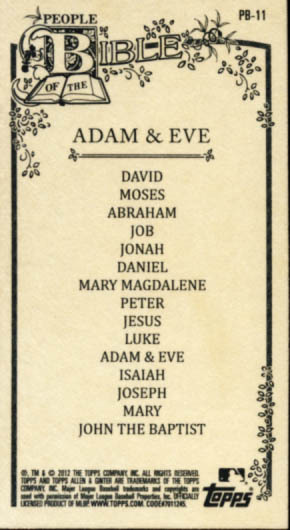 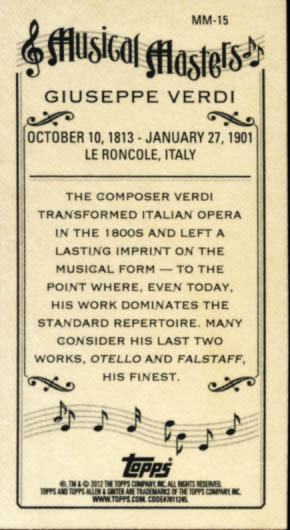 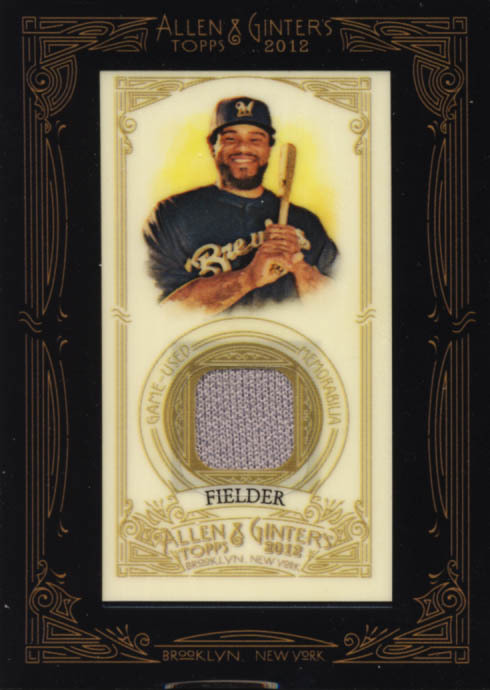 The black border frame is the chose for the majority of the hits available. 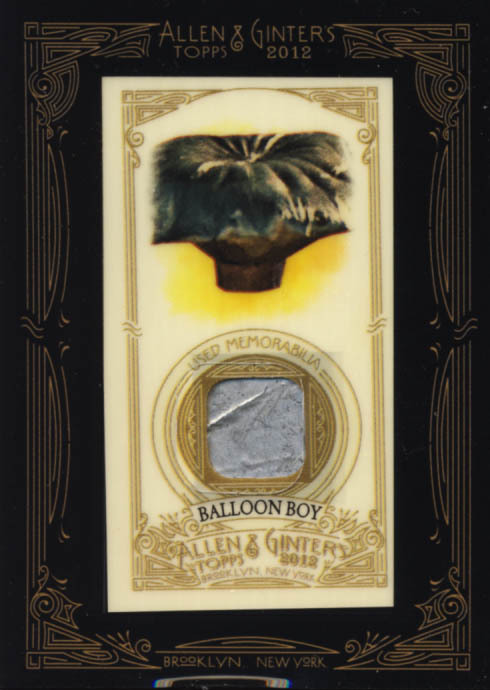 Unfortunately all three of our hits were damaged on the bottom, a shame because the Balloon Boy relic looks like it would be a great card in good condition. 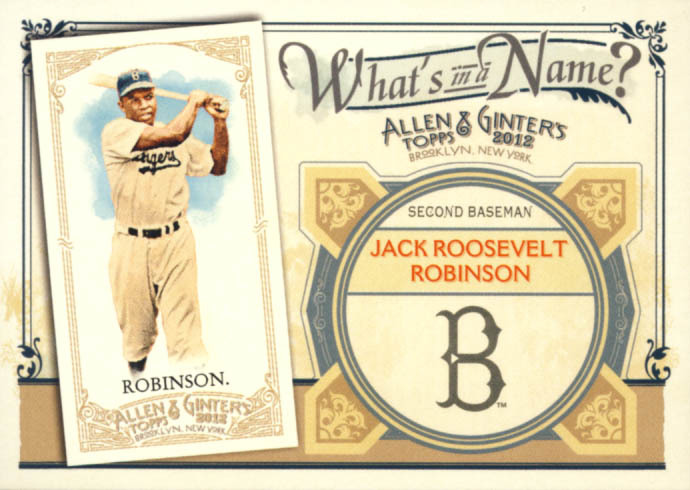 The booklet cards with the return of the popular bat knob are fantastic. 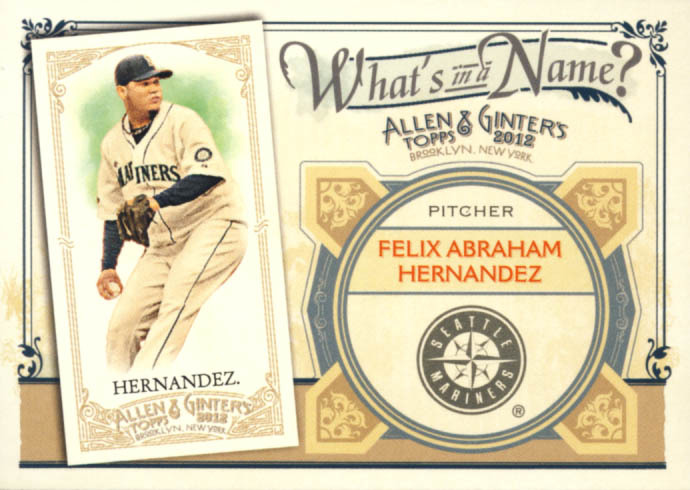 The majority of the hits appear to be the tiny player relics. 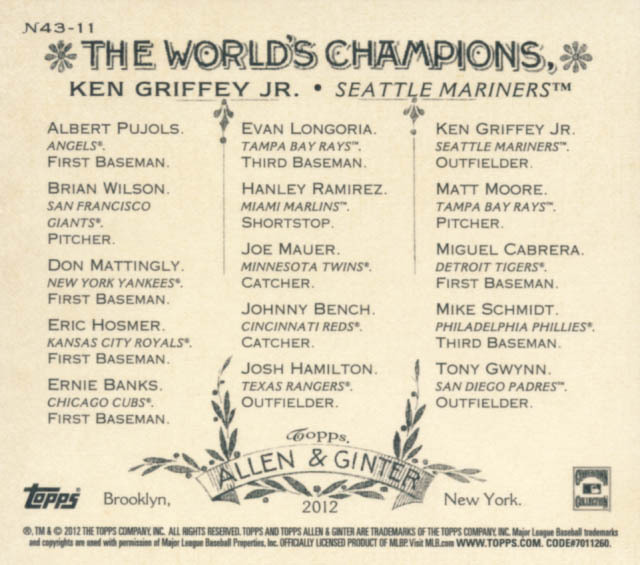 At this point, I would prefer doing away with most of them and exchanging them for one quality hit per box. 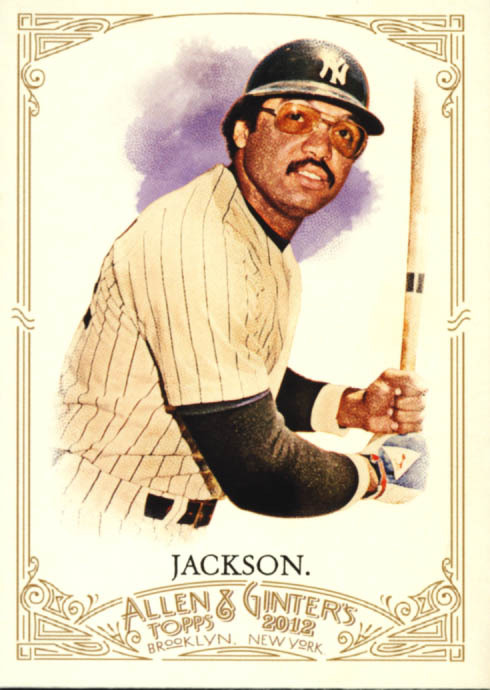 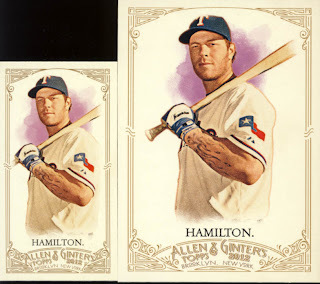 The base set and inserts hold their own, so lots of little hits are not necessary. 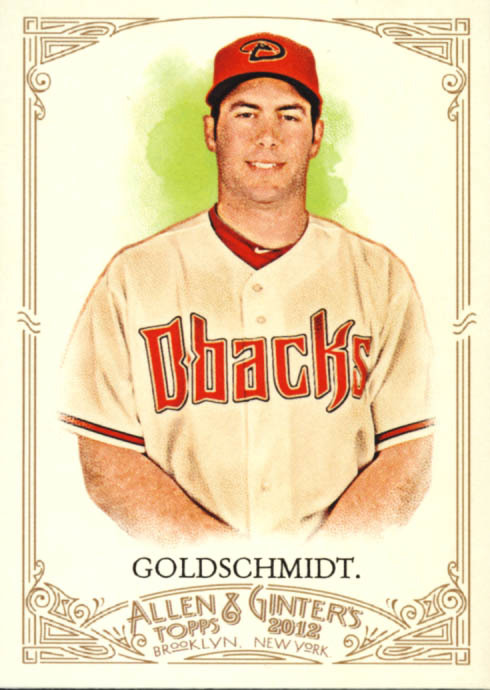 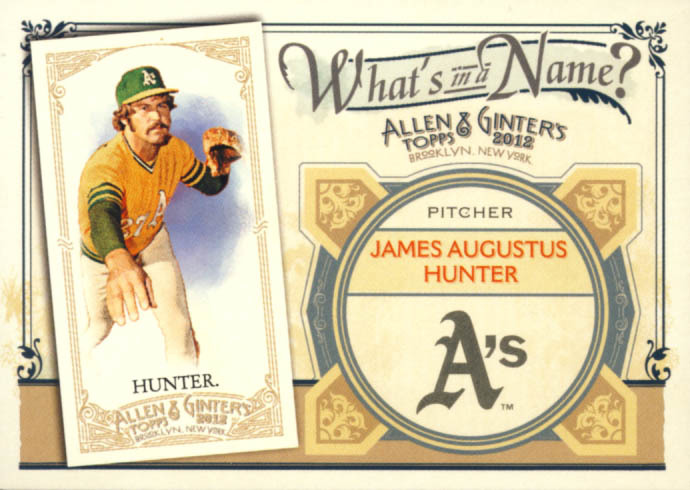 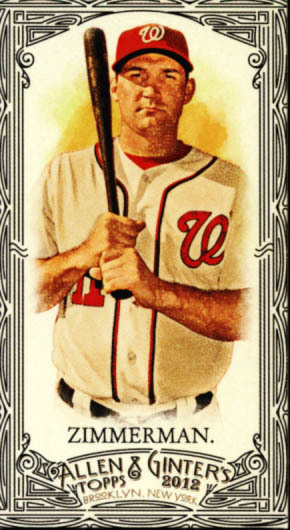 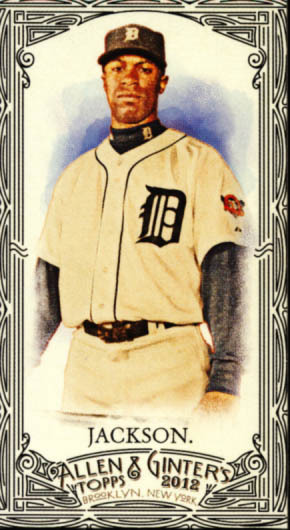 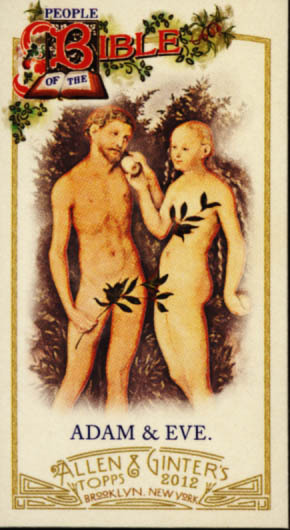 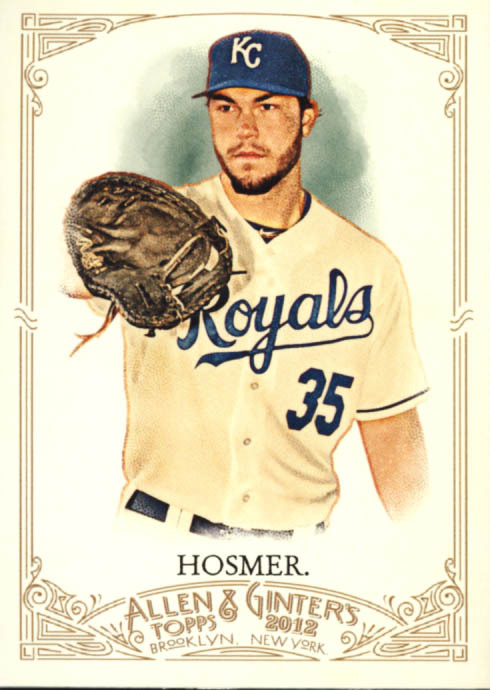 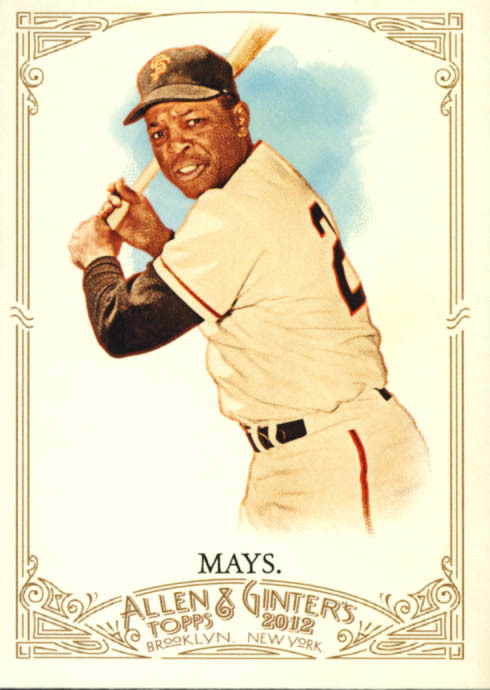 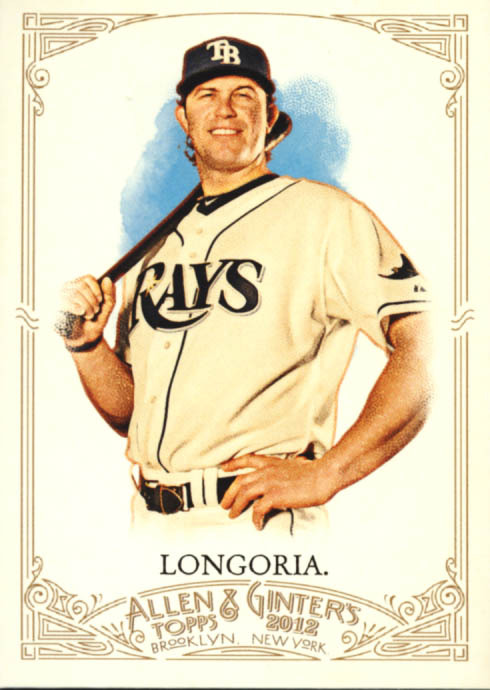 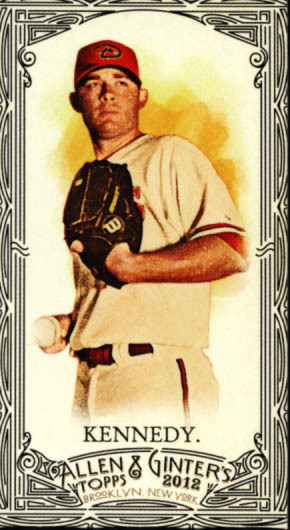 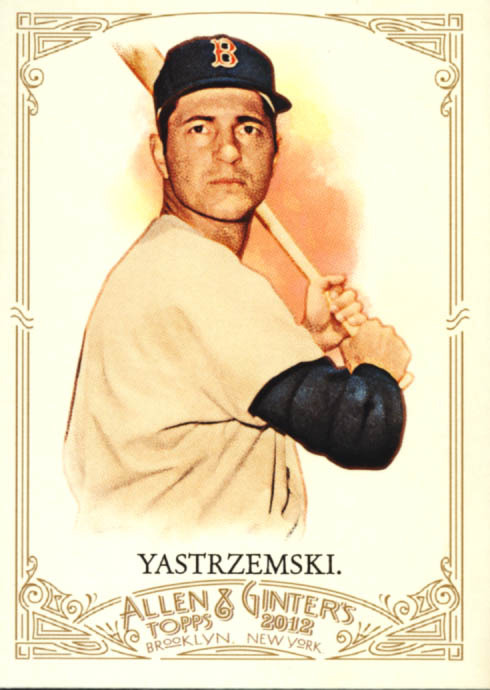 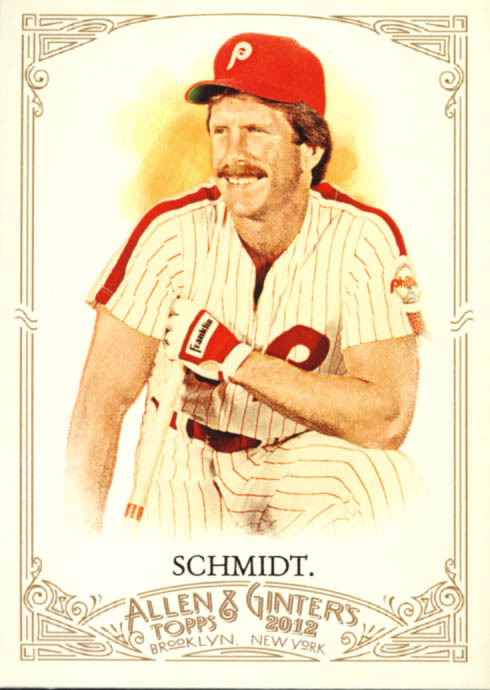 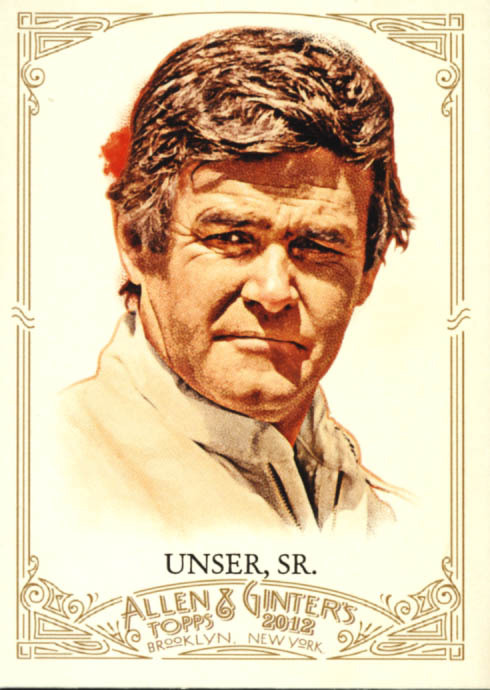 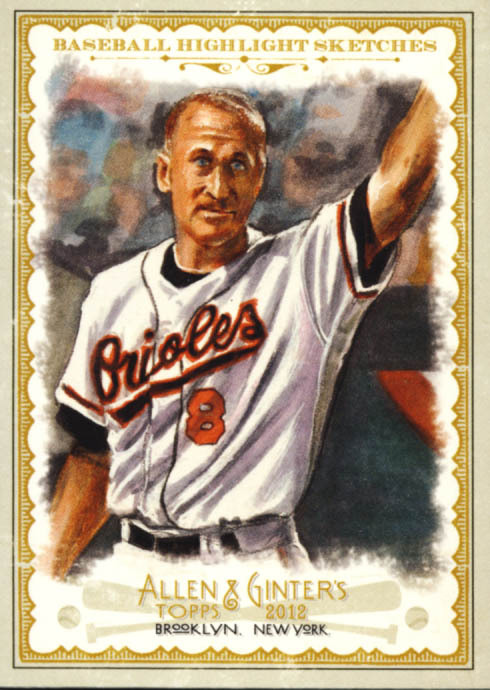 Ginter"s quirky nature makes this one of the best sets to build each year. 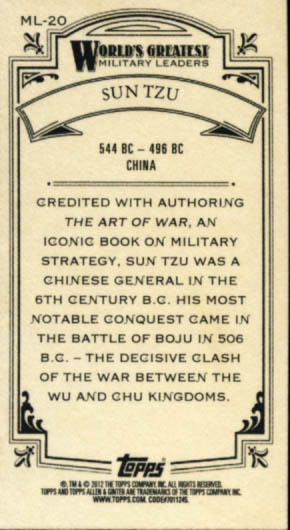 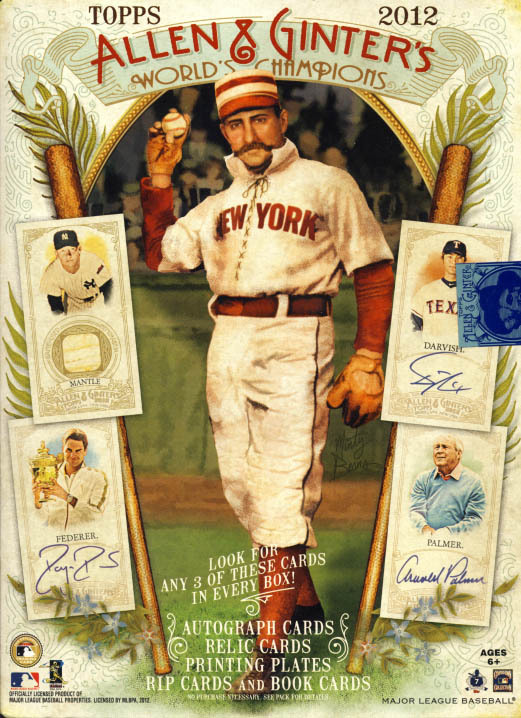 This is one that even basic card collectors toy with the idea of putting together a master set. 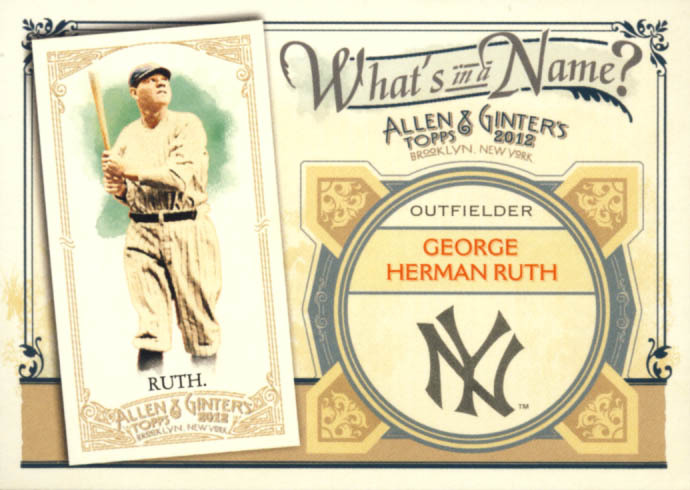 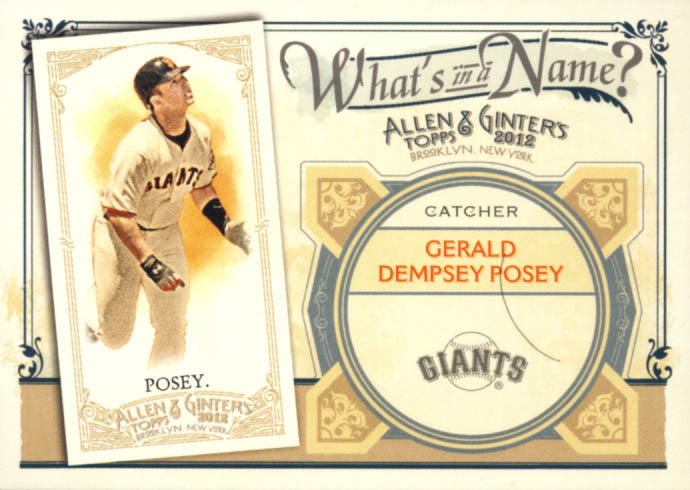 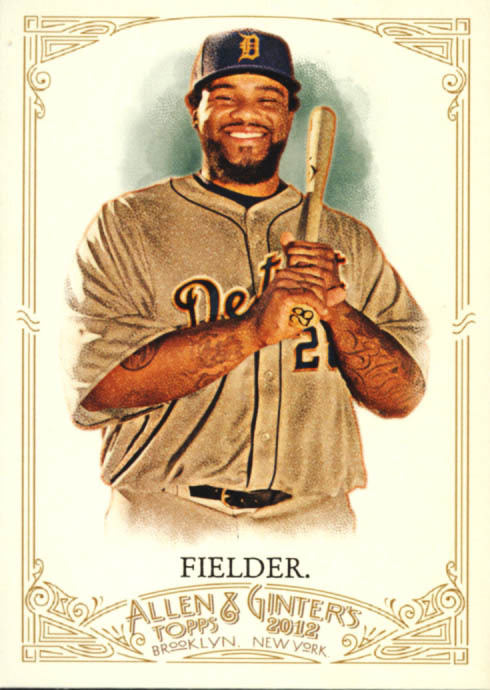 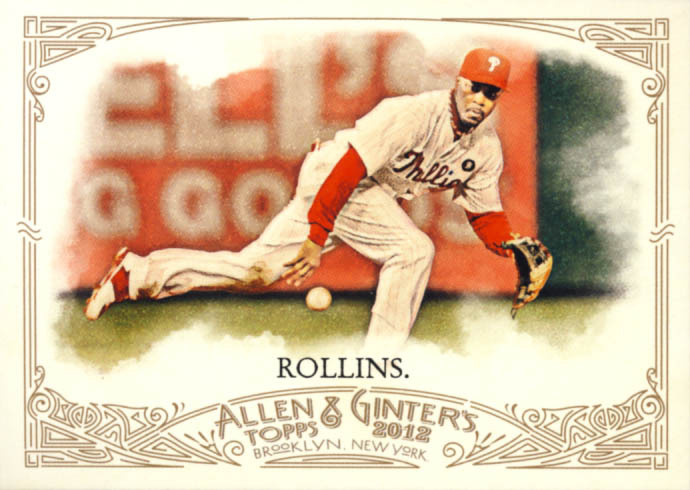 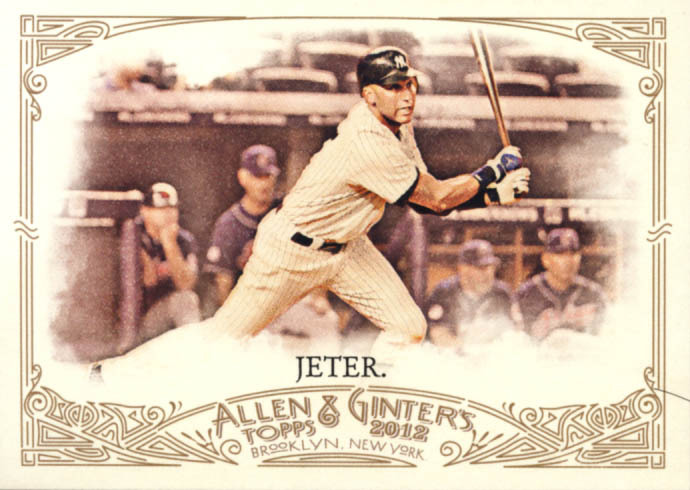 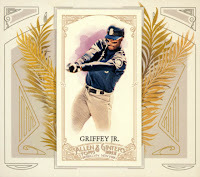 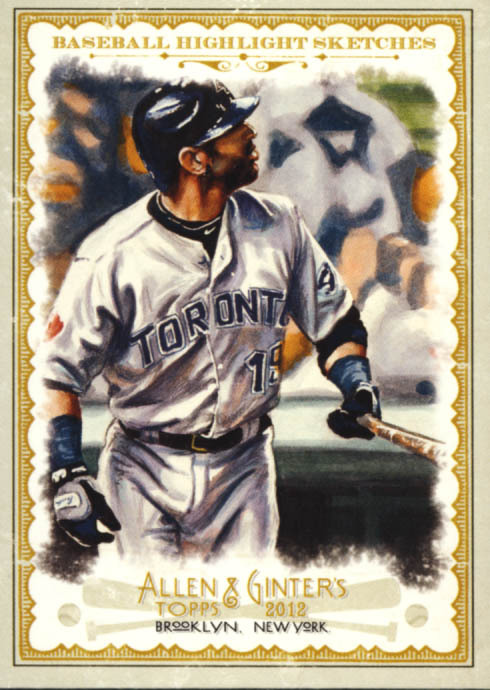 2012 Topps Allen & Ginter is another solid release that will keep set builders happily busy for quite a while.